From the gemstone anniversary list your 8th anniversary is celebrated with Tourmaline, a gorgeous sparkling gem that can be found in many colors. There are so many colors that it is often referred to as the rainbow stone. Ancient Egyptians believed that Tourmaline gained its many colors when it passed over a rainbow on its long journey from the center of the earth. With so many colors, Tourmaline gifts are stunning. 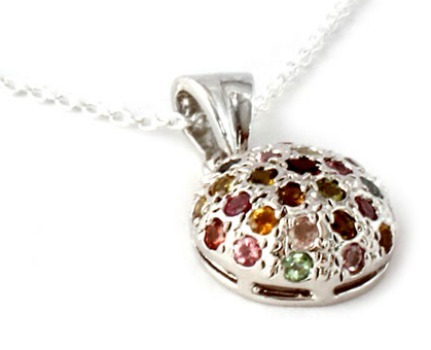 Each color Tourmaline has different meanings and strengths and all are perfect for an 8th anniversary gift. Green: for life force and energy, enhances cooperation and healing. Dark Pink: unites heart and body, represents creativity, love and devotion. Pink and Green: brings together compassion, passion and love. When it comes to choosing an 8th anniversary gift with meaning, you may want to choose a piece that has lots of colors, that way you are combining all of its great strengths. One of the great things about choosing to use the gemstone anniversary list is that you can use the locations of where you would find them as the starting point for an incredible vacation. Just think how amazing it would be to find your very own tourmaline for your 8th anniversary gift! Tourmaline is found in many places in the world; Brazil, United States, Sri Lanka, Tanzania, Kenya, Nigeria, Madagascar, Mozambique, Namibia, Pakistan, Afghanistan and Malawi.